Talisker Whisky Thames Challenge. — NORTH BLOG. What a cracking start to the day. 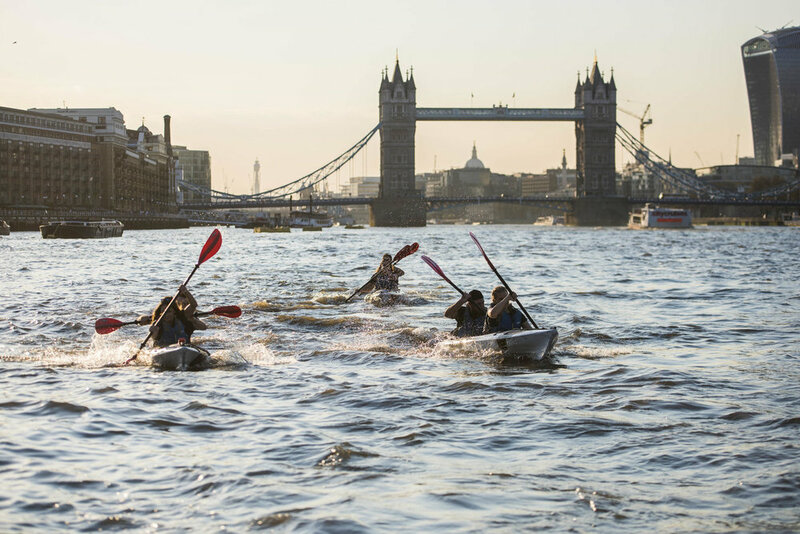 The sun was shining, the wind was calm, the whole buzz throughout London was vibrant, it was the perfect atmosphere and time to start the Talisker Whisky Thames challenge. I had never ever thought I would of had the opportunity to kayak down the river Thames in one of the most happening cities in the world on a perfect sunny day. Today a dream of exploring London in a unique way couldn’t have came to reality any better. It came together when I was asked by Talisker Whisky from the Isle of Skye if I would accept the challenge of taking part in this adventure around the city to experience the elements with an exclusive adventure curated by urban adventure experts Secret Adventures. This was an easy yes, as it was a once in a lifetime opportunity i don’t think I would ever get again. The kayak down the Thames started at St Mary’s Church, Battersea at 4pm. Myself and Lizzie Carr my tandem kayak partner, who currently holds the world record for paddle boarding across the English Channel, met with the other two groups who were taking part in the tandem kayak. I was a little nervous at first as we were competing against some fellow champions who had rowed across the Atlantic, Angus Collins and Lauren Morton who both had such experience and a good feel for being in the water... But on the other hand, Sophie Radcliffe a keen sportswoman, plus James Thompson a well travelled food blogger were both in the same position as me. First thing James jokingly said to me which i found quite funny was that he had no idea why he got asked to do the challenge at first as he’s not sporty at all, he’s a food man, but I’m pretty sure he had his eyes set on making it to the finish line for some fresh oysters being served by the Oystermen. It was time to start, first we got a Health and Safety Briefing from Moo Canoes showing us the basics of what to avoid when in the water, when to stop, what line to follow and overall how to feel fully confident in the kayak. This was not my first time kayaking so i was already familiar with being in a kayak at least, but it was very useful to get a clear insight on how to kayak down one of the busiest rivers in the UK. The finish line was at The Mayflower Pub, Rotherhithe street around 5 miles from St Mary’s Church, the start point. This was estimated to take us around two hours including all the stops we had to make along the Thames due to boats etc, I wanted to get there fast, then start enjoying some well earned Talisker Cocktails afterwards. 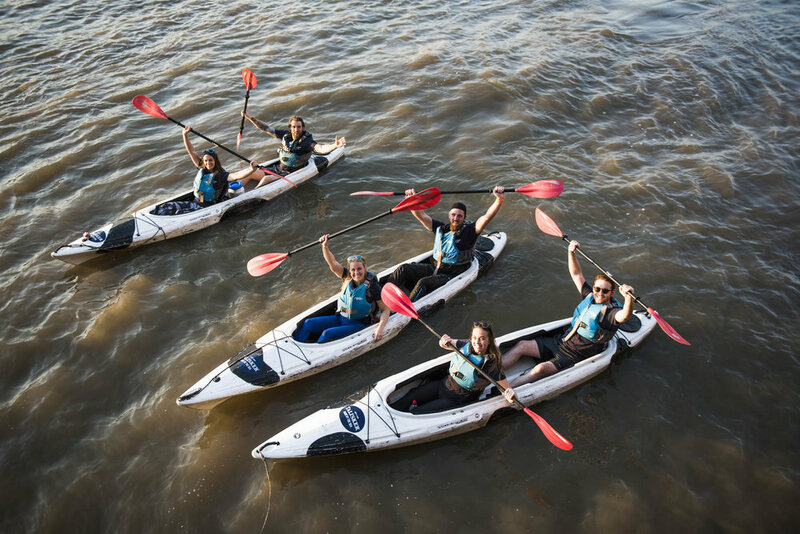 Kayaking down the Thames really was an amazing experience, not only because i got to kayak but also because of all the amazing places we kayaked by, such as the Palace of Westminster, Big Ben, the London eye and under Tower Bridge to name just a few. Another great part of doing this is that i was expecting it to be really physically demanding but it actually wasn’t that bad at all, purely because we were going with the water current and we lucked out with a beautiful sunny day and not too much Thames traffic. After roughly two hours kayaking we finally made it to The Mayflower Pub with a warming champions welcome served with oysters and a great tasting Talisker Whisky Cocktail, I went for the Talisker 10 Highball, a refreshing serve with ginger ale and fresh lime, or the Talisker Thames Adventurer, with Talisker Skye, ginger wine and orange bitters. Each sip is designed to transport participants to Talisker’s remote and rugged environment, where the distillery is battered by the elements and the storm-tossed sea on Skye every day. This drink is included in the ticket purchase (Link Below). My day was made and to top it off the sunset along the Thames made it that much more magical on the Mayflower terrace. But that wasn’t the end of the evening, we were fortunate enough to also have some guest speakers. Lauren Morton who took part in the kayak challenge gave us a lovely talk on her experience rowing the Atlantic not just once but twice, as the first time didn’t exactly go to plan but she made up for it and conquered it the second time with flying colours. Good inspiration for people not to give up on a first try when it comes to something they want to achieve. We were also treated to a chat from the Four Oarsmen who gave an in-depth talk on finishing first and setting a new world record for rowing the Atlantic taking them 29 days, 14 hours and 34 minutes, What an achievement. Hope you enjoy the video below, and get outside, live life to the fullest and keep striving.